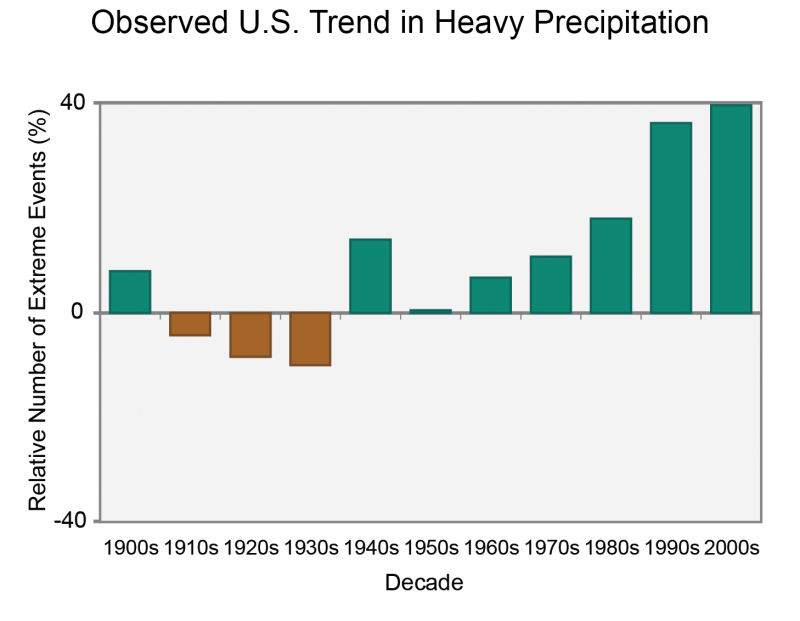 Extreme precipitation events have produced more rain and become more common since the 1950s in many regions of the world, including much of the United States. 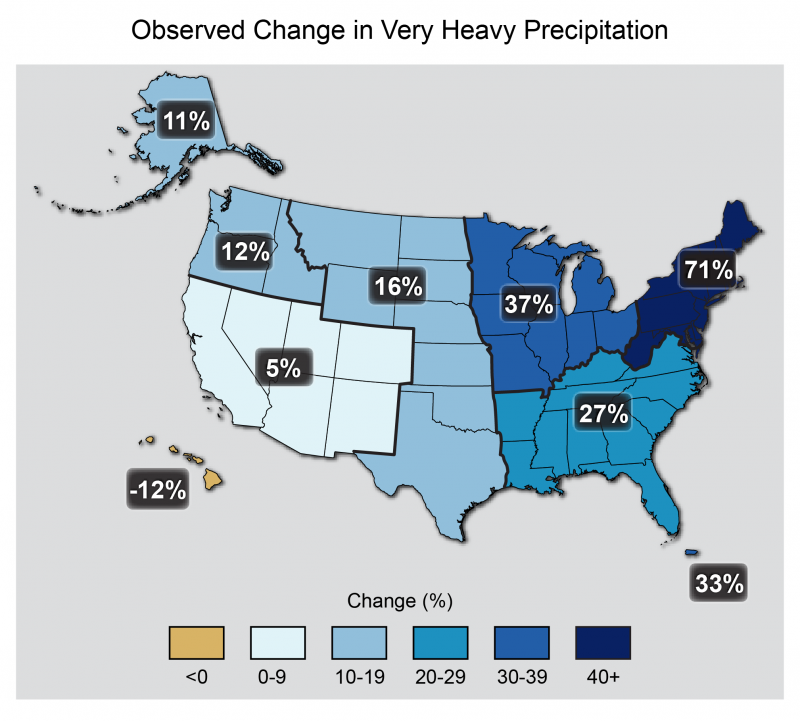 In the U.S., the Midwest and Northeast have seen the strongest increases in heavy precipitation events. Scientists expect these trends to continue as the planet continues to warm. Warmer air can hold more water vapor. For each degree of warming, the air’s capacity for water vapor goes up by about 7 percent. An atmosphere with more moisture can produce more intense precipitation events, which is exactly what has been observed. Increases in heavy precipitation may not always lead to an increase in total precipitation over a season or over the year. Some climate models project a decrease in moderate rainfall, and an increase in the length of dry periods, which offsets the increased precipitation falling during heavy events. The map shows percent increases regionally in the amount of precipitation falling in very heavy events (defined as the top 1% of all daily events) from 1958 to 2012. In August 2017, Hurricane Harvey dumped 48 inches of rain on Houston, breaking the U.S. record for most rainfall from a single event and demonstrating that the biggest threat from tropical cyclones is not always coastal flooding and wind damage. In July 2016, more than six inches of rain fell in two hours in historic Ellicott City, Maryland, causing more than $22 million in damages. In September 2013, Boulder, Colorado, received almost a year’s worth of rainfall (17 inches) in four days. The resulting flooding destroyed homes, shut down thousands of oil and gas wells, and damaged crops. In 2010, almost 20 inches of rain fell in the Nashville, Tennessee, area over three days. Losses in Nashville alone totaled over $1 billion. In addition to flooding, heavy precipitation also increases the risk of landslides. When above-normal precipitation raises the water table and saturates the ground, slopes can lose their stability, causing a landslide. Washington state, which has a particularly high risk of landslides due to its terrain, is anticipating more frequent landslides as a result of climate change-induced increases in heavy downpours. Excessive precipitation can also degrade water quality, harming human health and ecosystems. Stormwater runoff, which often includes pollutants like heavy metals, pesticides, nitrogen, and phosphorus, can end up in lakes, streams, and bays, damaging aquatic ecosystems and lowering water quality for human uses. Many cities in the United States use a combined sewer system, where both stormwater and wastewater are mixed, treated, and released. Heavy rainfall can overwhelm such systems, sending excess stormwater, wastewater, and untreated sewage directly into the environment, risking public health and disrupting local fisheries. Relative frequency of once-in-five-year precipitation events falling over a 2-day period, averaged over the continental U.S, 1901-2012. Green bars in recent decades show these events have become more frequent, when averaged across much of the country. Updating zoning regulations so that buildings and infrastructure are built on higher ground or in areas that are less prone to flooding. Updating building codes and design guidelines to raise buildings. Using flood control infrastructure, as was done, for example, by the Port Authority of New York and New Jersey after Hurricane Sandy. Incentivizing actions to reduce flood risk, like those included in the National Flood Insurance Program Community Rating System. Purchasing flood insurance to cover property losses and business disruptions. Separating storm water systems from wastewater systems, using holding ponds, or increasing water treatment capacity to avoid sending untreated sewage into local waterways.